Bhedābheda (Devanagari: भेदाभेद) is a Sanskrit word meaning "difference and non-difference". The characteristic position of all the different Bhedābheda Vedānta schools is that the individual self (jīvātman) is both different and not different from the ultimate reality known as Brahman. Bhedābheda reconciles the positions of two other major schools of Vedānta. The Advaita (Non-dual) Vedānta that claims that the individual self is completely identical to Brahman, and the Dvaita (Dualist) Vedānta that teaches complete difference between the individual self and Brahman. Bādarāyaṇa’s Brahma Sūtra (c. 4th century CE) may also have been written from a Bhedābheda Vedāntic viewpoint. Each thinker within the Bhedābheda Vedānta tradition has their own particular understanding of the precise meanings of the philosophical terms "difference" and "non-difference". Bhedābheda Vedāntic ideas can traced to some of the very oldest Vedāntic texts, including quite possibly Bādarāyaṇa’s Brahma Sūtra (c. 4th century CE). Nimbārka (7th century), who founded the Svābhābika Dvaitādvaita school. Bhāskara (8th and 9th centuries), who founded the Aupādhika Bhedābheda school. Other major names are Rāmānuja’s teacher Yādavaprakāśa, and Vijñānabhikṣu (16th century). ^ a b c d e "Bhedabheda Vedanta". Internet Encyclopedia of Philosophy. Retrieved 2015-02-04. ^ Sivananda 1993, p. 247-253. This Hindu philosophy-related article is a stub. You can help Wikipedia by expanding it. Adi Shankara was a philosopher and theologian from India who consolidated the doctrine of Advaita Vedanta. He is credited with unifying and establishing the main currents of thought in Hinduism and his works in Sanskrit discuss the unity of the ātman and Nirguna Brahman brahman without attributes. He wrote copious commentaries on the Vedic canon in support of his thesis and his works elaborate on ideas found in the Upanishads. Shankaras publications criticised the ritually-oriented Mīmāṃsā school of Hinduism and he explained the key difference between Hinduism and Buddhism, stating that Hinduism asserts Atman exists, while Buddhism asserts that there is no Soul, no Self. Shankara travelled across the Indian subcontinent to propagate his philosophy through discourses and debates with other thinkers and he established the importance of monastic life as sanctioned in the Upanishads and Brahma Sutra, in a time when the Mīmāṃsā school established strict ritualism and ridiculed monasticism. 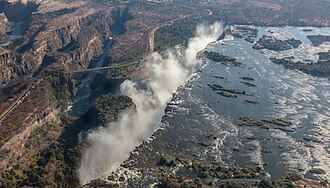 He is reputed to have founded four mathas, which helped in the development, revival. 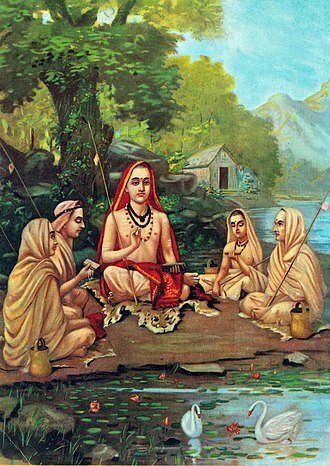 Adi Shankara is believed to be the organiser of the Dashanami monastic order and he is known as Adi Shankaracharya, Shankara Bhagavatpada, sometimes spelled as Sankaracharya, Śaṅkarācārya, Śaṅkara Bhagavatpāda and Śaṅkara Bhagavatpādācārya. There are at least fourteen different known biographies of Adi Shankaras life, many of these are called the Śankara Vijaya, while some are called Guruvijaya and Shankaracaryacarita. Of these, the Brhat-Sankara-Vijaya by Citsukha is the oldest hagiography but only available in excerpts, other significant biographies are the Mādhavīya Śaṅkara Vijayaṃ, the Cidvilāsīya Śaṅkara Vijayaṃ, and the Keraļīya Śaṅkara Vijayaṃ. Some biographies are probably forgeries by those who sought to create a basis for their rituals or theories. Adi Shankara died in the thirty third year of his life, the Sringeri records state that Shankara was born in the 14th year of the reign of VikramAditya, but it is unclear as to which king this name refers. This conforms to the chronology calculated based off the Hindu Puranas, 44–12 BCE, the commentator Anandagiri believed he was born at Chidambaram in 44 BCE and died in 12 BCE. Chinmayananda is known for teaching Bhagavad gita, the Upanishads, and other ancient Hindu scriptures. From 1951 onward, he spearheaded a global Hindu spiritual and cultural renaissance that popularised the religions esoteric scriptural texts, teaching them in English all across India, Chinmayananda inspired the formation of Chinmaya Mission in 1953. Founded by his disciples and led by him, it is a spiritual, educational and he authored 95 publications, including commentaries on the major Upanishads and Bhagavad gita. He was a professor of Indian philosophy at several American and Asian universities. He died on 3 August 1993 and his mother, Parukutty Amma died while giving birth to her third child. He completed his schooling in Sree Rama Varma High School and Vivekodayam School. He completed his FA at the Maharajas College and his BA at the St. Thomas College and he went on to Lucknow University to earn postgraduate degrees in literature and law, while completing courses in journalism. Although he would go on to become a spiritual teacher, in his student years. 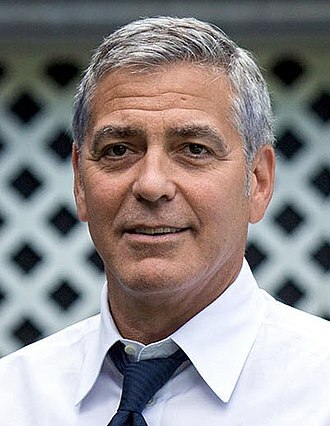 In the summer of 1936, he visited the eminent sage, when word of a warrant for his arrest issued because of these activities reached him, he went undercover. He spent the year moving around in the state of Abbottabad, out of range of British officials. Almost two years after the British had issued his arrest warrant, believing his case was long forgotten, Balan arrived in Punjab and he advised students on distributing leaflets and organising public strikes but was arrested and imprisoned. He spent several months in conditions in prison and caught typhus. This caused him to be among those who were carried out into the night and tossed beside a road on the outskirts of the city, where he was found by a passing Indian Christian. Reminded of her son serving in the army, she took him to her home and called for a doctor, K. Rama Rao gave Balan his first job, at The National Herald. He wrote a series of articles on the imperative of socialism in a society where the vast majority of people were poor and he covered subjects ranging from history and culture to social and political issues. Ramanuja was a Hindu theologian and one of the most important exponents of the Sri Vaishnavism tradition within Hinduism. He was born in a Tamil Brāhmin family in the village of Sriperumbudur and his philosophical foundations for devotionalism were influential to the Bhakti movement. Rāmānujas guru was Yādava Prakāsa, a scholar who was a part of the more ancient Advaita Vedānta monastic tradition, Rāmānuja is famous as the chief proponent of Vishishtadvaita subschool of Vedānta, and his disciples were likely authors of texts such as the Shatyayaniya Upanishad. Rāmānuja himself wrote influential texts, such as bhāsya on the Brahma Sutras, Rāmānuja presented the epistemic and soteriological importance of bhakti, or the devotion to a personal God as a means to spiritual liberation. The details of historic Rāmānuja are unknown and his followers in the Vaishnava tradition wrote hagiographies, some of which were composed in centuries after his death, and which the tradition believes to be true. The traditional hagiographies of Rāmānuja state he was born in a Brāhmin family, to mother Kānthimathi and father Kesava Somayāji, in Sriperumbudur, near modern Chennai and they place his life in the period of 1017–1137 CE, yielding a lifespan of 120 years. Rāmānuja married, moved to Kānchipuram, studied in an Advaita Vedānta monastery with Yādava Prakāsa as his guru, Rāmānuja and his guru frequently disagreed in interpreting Vedic texts, particularly the Upanishads. Rāmānuja and Yādava Prakāsa separated, and thereafter Rāmānuja continued his studies on his own and he attempted to meet another famed Vedanta scholar of 11th-century Yamunāchārya, but Sri Vaishnava tradition holds that the latter died before the meeting and they never met. However, some assert that the corpse of Yamunāchārya miraculously rose. One hagiography states that after leaving Yādava Prakāsa, Rāmānuja was initiated into Sri Vaishnavism by Periya Nambi, called Māhapurna, Rāmānuja renounced his married life, and became a Hindu monk. The Muvāyirappaṭi Guruparamparāprabhāva by Brahmatantra Svatantra Jīyar represents the earliest Vadakalai biography, Ārāyirappaṭi Guruparamparāprabhāva, on the other hand, represents the Tenkalai biography. Other late biographies include the Yatirajavaibhavam by Andhrapurna, modern scholarship has questioned the reliability of these hagiographies. According to J. A. B. van Buitenen, the hagiographies are legendary biographies about him, Rāmānuja grew up in the Tamil culture, in a stable society during the rule of the Hindu Cholas dynasty. This period was one of pluralistic beliefs, where Vaishnava, Smarta traditions, in Hindu monastic tradition, Advaita Vedānta had been dominant, and Rāmānujas guru Yādava Prākāsha belonged to this tradition. Rāmānujas fame grew because he was considered the first thinker in centuries that disputed Shankaras theories, some modern scholars have questioned the authenticity of all but the three of the largest works credited to Rāmānuja – Shri Bhāshya, Vedārthasangraha and the Bhagavad Gita Bhāshya. Rāmānujas philosophical foundation was qualified monism, and is called Vishishtadvaita in the Hindu tradition and his ideas are one of three subschools in Vedānta, the other two are known as Ādi Shankaras Advaita and Madhvāchāryas Dvaita. 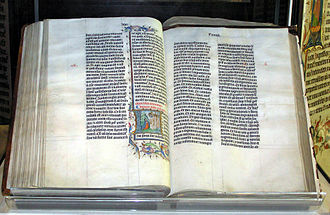 There is no reason, stated Rāmānuja, to one part of a scripture and not other. Swami Vivekananda Bengali, Shāmi Bibekānondo,12 January 1863 –4 July 1902), born Narendranath Datta, was an Indian Hindu monk, a chief disciple of the 19th-century Indian mystic Ramakrishna. He was a force in the revival of Hinduism in India. Vivekananda founded the Ramakrishna Math and the Ramakrishna Mission and he is perhaps best known for his speech which began and brothers of America. 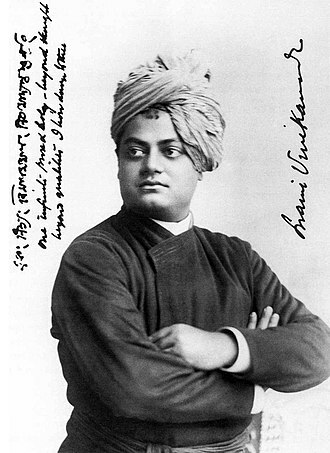 In which he introduced Hinduism at the Parliament of the Worlds Religions in Chicago in 1893, born into an aristocratic Bengali family of Calcutta, Vivekananda was inclined towards spirituality. He was influenced by his Guru, Ramakrishna Deva, from whom he learnt that all living beings were an embodiment of the self, therefore. After Ramakrishnas death, Vivekananda toured the Indian subcontinent extensively and acquired knowledge of the conditions prevailing in British India. He travelled to the United States, representing India at the 1893 Parliament of the World Religions, Vivekananda conducted hundreds of public and private lectures and classes, disseminating tenets of Hindu philosophy in the United States and Europe. In India, Vivekananda is regarded as a saint and his birthday is celebrated there as National Youth Day. Vivekananda was born Narendranath Datta at his home at 3 Gourmohan Mukherjee Street in Calcutta. He belonged to a traditional Bengali Kayastha family and was one of nine siblings and his father, Vishwanath Datta, was an attorney at the Calcutta High Court. Durgacharan Datta, Narendras grandfather was a Sanskrit and Persian scholar who left his family and his mother, Bhubaneswari Devi, was a devout housewife. The progressive, rational attitude of Narendras father and the temperament of his mother helped shape his thinking. Narendranath was interested spiritually from an age, and used to meditate before the images of deities such as Shiva, Sita. He was fascinated by wandering ascetics and monks, naren was naughty and restless as a child, and his parents often had difficulty controlling him. His mother said, I prayed to Shiva for a son, in 1871, at the age of eight, Narendranath enrolled at Ishwar Chandra Vidyasagars Metropolitan Institution, where he went to school until his family moved to Raipur in 1877. Pillai Lokacharya was a prominent Sri Vaishnava leader and philosopher who authored several works important to Vishishtadvaita philosophy. The name Ulag-Ariya first became associated with Sri Nampillai when Sri Kanthadai Thozhappar celebrated him as the acharya for the world, nampillais disciple was Sri Vadakku Thiruveethippillai. Out of great affection for his acharya, Vadakku Thiruveethippillai named his first son as Pillai Lokacharya, once Nampillai asked Vadakkuth Thiruveethip pillais mother Ammi about her welfare. She told him that she was sad as her family was not being furthered because her son was staying away from his wife and was not having a child, Nampillai asked her to bring her daughter-in-law to his presence. When she did, he told her daughter-in-law that she would birth to a son just like himself. He called his disciple Vadakkuth Thiruveethippillai and told him to follow proper gruhastAsrama, Vadakkuth Thiruveethippillai obeyed his acharyas words and in time a son was born to him, he named him Pillai Lokacharya out of respect for his acharya. While worshipping Lord Renganatha with his disciples son on his Apthapoorthi day, the second son was named Azhagiya Manavala Perumal Nayanar, after Lord Renganatha. Sri Pillai Lokacharya was born as the amsam of Kanchi Devaraja Perumal in the month of Aippasi under the star Thiruvonam, in their youth, both brothers learned everything from their acharya Nampillai as well as from their father. They grew up like Sri Rama and Sri Lakshmana, in foreword to his vyakhyanam of Sri Vacana Bhushanam, Manavala Mamunigal tells of the following event. Once upon a time Kanchi Devaraja Perumal out of His nirhEduka krupa selected one Manarpakkam Nambi and he advised him to go live in Srirangam and wait for Him there where He will teach him in further detail those meanings. Manarpakkam Nambi moved to Srirangam, built a temple and quietly lived there worshipping Him. One day Pillai Lokacharya came to temple with his close disciples. Nambi listening from inside noted that these meanings were the same as taught by Lord Varadaraja to him and he came out and bowing at Pillai Lokacharyas feet, asked him AvarO neer. Saiva siddhānta, provides the normative rites and theological categories of Agamic and Vedic Shaivam combined. Being a dualistic philosophy, the goal of Shaiva Siddhanta is to become a soul through Lord Sivas Grace. This tradition was once practiced all over India, however the Muslim subjugation of North India restricted Shaiva Siddhanta to the south, where it merged with the Tamil Saiva movement expressed in the bhakti poetry of the Nayanars. It is in historical context that Shaiva Siddhanta is commonly considered a southern tradition. The Tamil compendium of songs known as Tirumurai, the Shaiva Agamas and Meykanda or Siddhanta Shastras. 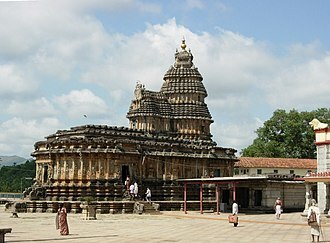 Shaiva Siddhanta encompasses tens of millions of adherents, predominantly in Tamil Nadu, the name of the school could be translated as the settled view of Shaiva doctrine or perfected Shaivism. Saiva Siddhantas original form is uncertain, some hold that it originated as a monistic doctrine, espoused by Tirumular. Such a notion of liberatory initiation appears to have borrowed from a Pashupata tradition. At the time of the development of the theology of the school, the question of monism or dualism. 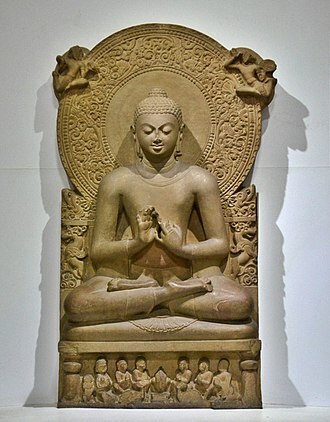 From the fifth to the eighth CE Buddhism and Jainism had spread in Tamil Nadu before a forceful Shaiva bhakti movement arose, between the seventh and ninth centuries, pilgrim saints such as Sambandar and Sundarar used songs of Shiva’s greatness to refute concepts of Buddhism and Jainism. Manikkavacakars heart-melting verses, called Tiruvacakam, are full of visionary experience, divine love, the Bhakti movement should not be exaggerated as an articulation of a class struggle, there is nevertheless a strong sense against rigis structures in the society. In the twelfth century Aghorasiva, the head of a monastery of the Amardaka order in Chidambaram, took up the task of amalgamating Sanskrit. Aghorasiva was successful in preserving the Sanskrit rituals of the ancient Āgamic tradition, to this day, Aghorasiva’s Siddhanta philosophy is followed by almost all of the hereditary temple priests, and his texts on the Āgamas have become the standard puja manuals. Buddhism is a religion and dharma that encompasses a variety of traditions and spiritual practices largely based on teachings attributed to the Buddha. 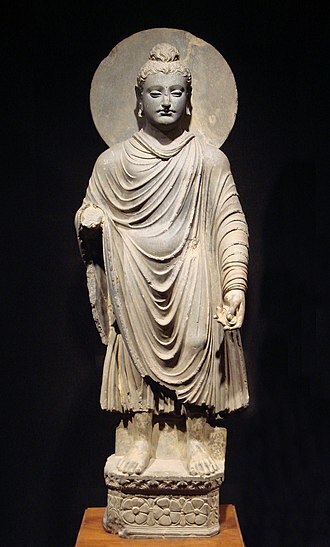 Buddhism originated in India sometime between the 6th and 4th centuries BCE, from where it spread through much of Asia, two major extant branches of Buddhism are generally recognized by scholars and Mahayana. Buddhism is the worlds fourth-largest religion, with over 500 million followers or 7% of the global population, Buddhist schools vary on the exact nature of the path to liberation, the importance and canonicity of various teachings and scriptures, and especially their respective practices. In Theravada the ultimate goal is the attainment of the state of Nirvana, achieved by practicing the Noble Eightfold Path, thus escaping what is seen as a cycle of suffering. Theravada has a following in Sri Lanka and Southeast Asia. Mahayana, which includes the traditions of Pure Land, Nichiren Buddhism, rather than Nirvana, Mahayana instead aspires to Buddhahood via the bodhisattva path, a state wherein one remains in the cycle of rebirth to help other beings reach awakening. Vajrayana, a body of teachings attributed to Indian siddhas, may be viewed as a branch or merely a part of Mahayana. Tibetan Buddhism, which preserves the Vajrayana teachings of eighth century India, is practiced in regions surrounding the Himalayas, Tibetan Buddhism aspires to Buddhahood or rainbow body. Buddhism is an Indian religion attributed to the teachings of Buddha, the details of Buddhas life are mentioned in many early Buddhist texts but are inconsistent, his social background and life details are difficult to prove, the precise dates uncertain. Some hagiographic legends state that his father was a king named Suddhodana, his mother queen Maya, and he was born in Lumbini gardens. Some of the stories about Buddha, his life, his teachings, Buddha was moved by the innate suffering of humanity. He meditated on this alone for a period of time, in various ways including asceticism, on the nature of suffering. He famously sat in meditation under a Ficus religiosa tree now called the Bodhi Tree in the town of Bodh Gaya in Gangetic plains region of South Asia. Nisargadatta Maharaj, born Maruti Shivrampant Kambli, was an Indian Guru of nondualism, belonging to the Inchagiri Sampradaya, a lineage of teachers from the Navnath Sampradaya and Lingayat Shaivism. The publication in 1973 of I Am That, an English translation of his talks in Marathi by Maurice Frydman, brought him recognition and followers, especially from North America. Nisargadatta was born on 17 April 1897 to Shivrampant Kambli and Parvatibai, the day was Hanuman Jayanti, the birthday of Hanuman, hence the boy was named Maruti, after him. His parents were followers of the Varkari sampradaya, an egalitarian Vaishnavite bhakti tradition which worships Vithoba and his father, worked as a domestic servant in Mumbai and became a petty farmer in Kandalgaon. Maruti Shivrampant Kambli was brought up in Kandalgaon, a village in the Ratnagiri district of Maharashtra. In 1915, after his father died, he moved to Bombay to support his family back home, following his elder brother. Initially he worked as a clerk at an office but quickly he opened a small goods store, mainly selling beedis – leaf-rolled cigarettes. In 1924 he married Sumatibai and they had three daughters and a son, in 1933, he was introduced to his guru, Siddharameshwar Maharaj, the head of the Inchegiri branch of the Navnath Sampradaya, by his friend Yashwantrao Baagkar. His guru told him, You are not what you take yourself to be, Siddharameshwar initiated him into the Inchegiri Sampradaya, giving him meditation-instruction and a mantra, which he immediately began to recite. I did not follow any particular course of breathing, or meditation, whatever happened, I would turn away my attention from it and remain with the sense I am. It may look too simple, even crude and my only reason for doing it was that my Guru told me so. My guru told me, Trust me, I tell you, you are Divine, take it as the absolute truth. Your joy is divine, your suffering is divine too and you are God, your will alone is done. I did believe him and soon realized how wonderfully true and accurate were his words, I did not condition my mind by thinking, I am God, I am wonderful, I am beyond. I simply followed his instruction, which was to focus the mind on pure being, I am, I used to sit for hours together, with nothing but the I am in my mind and soon the peace and joy and deep all-embracing love became my normal state. Vaishnavism is one of the major traditions within Hinduism along with Shaivism and Smartism. It is called Vishnuism, its followers are called Vaishnavas, the tradition is notable for its avatar doctrine, wherein Vishnu is revered in one of many distinct incarnations. Of these, ten avatars of Vishnu are the most studied, Rama, Narayana, Vāsudeva, Vithoba, Madhava and Jagannath are among the popular names used for the same supreme. The tradition has traceable roots to the 1st millennium BCE, as Bhagavatism, developments led by Ramananda created a Rama-oriented movement, now the largest monastic group in Asia. The Vaishnava tradition has many sampradayas ranging from the medieval era Dvaita school of Madhvacharya to Vishishtadvaita school of Ramanuja, new Vaishnavism movements have been founded in the modern era such as the ISKCON of Prabhupada. The tradition is known for the devotion to an avatar of Vishnu. Key texts in Vaishnavism include the Vedas, the Upanishads, the Bhagavad Gita, the Pancaratra texts, Krishnaism becomes associated with bhakti yoga in the medieval period. Although Vishnu was a Vedic solar deity, he is mentioned less often compared to Agni and other Vedic deities, other scholars state that there are other Vedic deities, such as water deity Nara, who together form the historical roots of Vaishnavism. The ancient emergence of Vaishnavism is unclear, the evidence inconsistent, according to Dalal, the origins may be in Vedic deity Bhaga, who gave rise to Bhagavatism. According to Preciado-Solís, the Vedic deities Nara and Narayana form one of the Vedic roots of Vaishnavism, according to Dandekar, Vaishnavism may have emerged from merger of several ancient theistic traditions, where the various deities were integrated as different avatars of the same god. 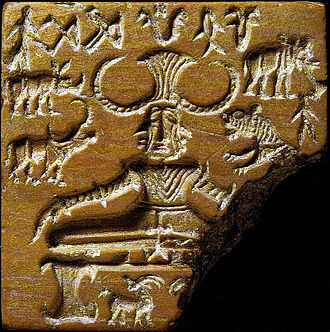 In Dandekar theory, Vaishnavism emerged at the end of the Vedic period, closely before the urbanisation of northern India. This earliest phase was established the time of Pāṇini who, in his Astadhyayi and this was followed by a merger with the cult of Gopala-Krsna of the cowherd community of the Abhıras at the 4th century CE. Ramakrishna Paramahamsa Ramkṛiṣṇo Pôromôhongśo,17 February 1836 –16 August 1886), born Gadadhar Chatterjee or Gadadhar Chattopadhyay, was an Indian mystic and yogi during the 19th-century. Admiration for him amongst Bengali elites led to the formation of the Ramakrishna Mission by his chief disciple Swami Vivekananda. Ramakrishna was born on 17 February 1836, in the village of Kamarpukur, in the Hoogli district of West Bengal, into a poor, pious. Kamarpukur was untouched by the glamour of the city and contained rice fields, tall palms, royal banyans, a few lakes and his parents were Khudiram Chattopadhyay and Chandramani Devi. According to his followers, Ramakrishnas parents experienced supernatural incidents and visions before his birth, in Gaya his father Khudiram had a dream in which Lord Gadadhara, said that he would be born as his son. Chandramani Devi is said to have had a vision of light entering her womb from Shivas temple, although Ramakrishna attended a village school with some regularity for 12 years, he rejected the traditional schooling saying that he was not interested in a bread-winning education. 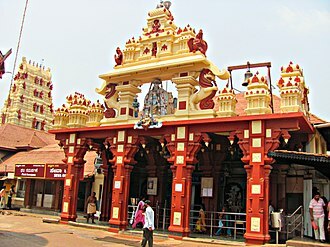 Kamarpukur, being a transit-point in well-established pilgrimage routes to Puri, brought him contact with renunciates. He could read and write in Bengali, Ramakrishna describes his first spiritual ecstasy at the age of six, while walking along the paddy fields, a flock of white cranes flying against a backdrop of dark thunder clouds caught his vision. He reportedly became so absorbed by this scene that he lost outward consciousness, Ramakrishna reportedly had experiences of similar nature a few other times in his childhood—while worshipping the goddess Vishalakshi, and portraying god Shiva in a drama during Shivaratri festival. From his 10th or 11th year of school on, the trances became common, early on, these experiences have been interpreted as epileptic seizures, an interpretation which was rejected by Ramakrishna himself. Ramakrishnas father died in 1843, after which family responsibilities fell on his elder brother Ramkumar, when Ramakrishna was in his teens, the familys financial position worsened. Ramkumar started a Sanskrit school in Calcutta and served as a priest, Ramakrishna moved to Calcutta in 1852 with Ramkumar to assist in the priestly work. In 1855 Ramkumar was appointed as the priest of Dakshineswar Kali Temple, along with his nephew Hriday, became assistants to Ramkumar, with Ramakrishna given the task of decorating the deity. When Ramkumar died in 1856, Ramakrishna took his place as the priest of the Kali temple, after Ramkumars death Ramakrishna became more contemplative. He began to look upon the image of the goddess Kali as his mother, Ramakrishna reportedly had a vision of the goddess Kali as the universal Mother, which he described as. Houses, doors and everything else vanished altogether, as if there was nothing anywhere, and what I saw was an infinite shoreless sea of light, a sea that was consciousness. However far and in whatever direction I looked, I saw shining waves, one after another, rumors spread to Kamarpukur that Ramakrishna had become unstable as a result of his spiritual practices at Dakshineswar. 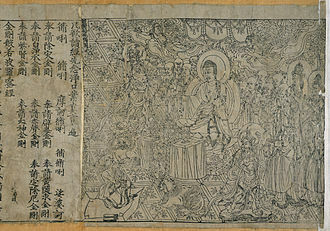 The Chinese Diamond Sutra, the oldest known dated printed book in the world, printed in the 9th year of Xiantong Era of the Tang Dynasty, or 868 CE. British Library. Ramanujacharya depicted with Vaishnava Tilaka and Vishnu statue. 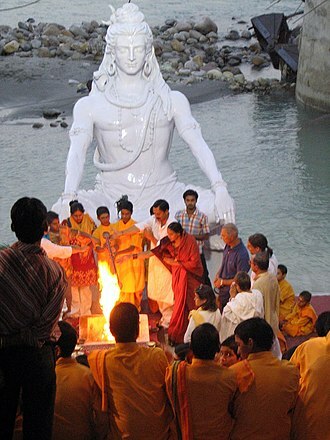 Shaktism is a Goddess-centric tradition of Hinduism. A 9th-century Durga Shakti idol, victorious over demon Mahishasura, in Indonesia. Sri Lalita-Tripurasundari enthroned with her left foot upon the Sri Chakra, holding her traditional symbols, the sugarcane bow, flower arrows, noose and goad. 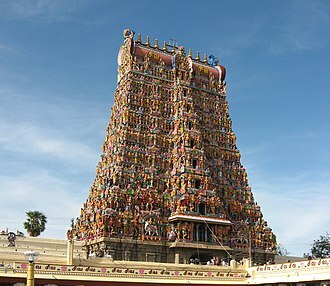 A gopuram (tower) of the Meenakshi Amman Temple, a Shakta temple at Madurai, Tamil Nadu, India, which was nominated in the "New Seven Wonders of the World" competition in 2004. Ramakrishna in bhava samadhi at the house of Keshab Chandra Sen. He is seen supported by his nephew Hriday and surrounded by brahmo devotees. Photograph of Ramakrishna, taken on 10 December 1881 at the studio of "The Bengal Photographers" in Radhabazar, Calcutta (Kolkata). Sri Ramana Maharshi in his late 60s. The Entrance of Sri Ramanasramam. The figure of Ramanuja in Upadesa Mudra inside the Ranganathaswamy Temple, Srirangam. Nisargadatta Maharaj met his guru Siddharameshwar Maharaj in 1933. 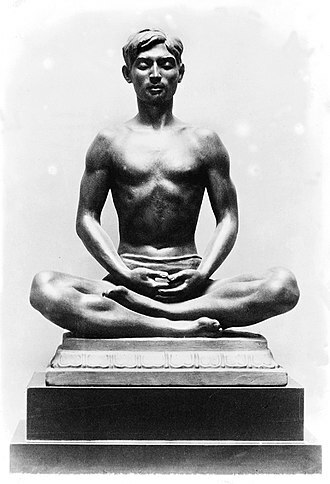 Bronze figure of a Kashmiri in Meditation by Malvina Hoffman (1885-1966). The yoga posture shown is siddhasana. Lord Nataraja, moderating Panchakritya, the supreme being of Siddhantism.